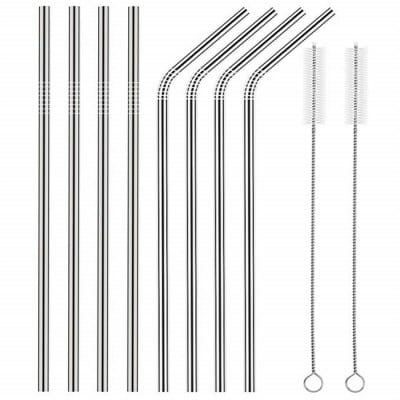 Set of 8pcs extra long stainless straws (4 bent straws + 4 straight straws + 2 cleaning brushes),total length of 24cm, perfect metal straws for drinking cold bevarage, sipping cocktail,coffee,ice tea,cappuccino etc. Plastic free and BPA free, Impress your friends and family when you pull out the healthy metal straws, You will bask in gratitude for reducing the use of plastic straws. Each and every day the straws help to lighten your carbon footprint and you can enjoy much more satisfying drinking experience! Modern and sleek stainless straws add fun to any party, trendy for family reunion,girl’s night out,cocktail party,Patio BBQ,picnics,boating and more!